Although I’ve not yet seen any other articles about this, Gordon Duff’s likely covers the main bases. I post a few highlights below. And the connections to Aspen, Colorado, are interesting. “The declassified documents were released by Congress on Friday and released them the same day, release of the documents confirmed suspicions that the terrorists involved in the 9/11 attacks – most of whom were Saudi nationals – likely received support from high-ranking Saudi intelligence officers. “…it does list prominent Saudis suspected of being involved with terrorism by US intelligence agencies. Editor’s note: Prince Bandar, former head of Saudi secret services, former Ambassador to the United States, has been tied directly to the planning of 9/11. Below, an excerpt in the widely censored release of the 28 long withheld pages, made a huge error. In naming ASPCOL Corporation as handling the “property” of Prince Bandar, those who failed to redact this section did not note that attorney William Jordan III, the sole proprietor of ASPCOL Corporation, not only represents Bandar’s property interests but has broader involvements in arms sales and more, as outlined in the February 12, 2008 Aspen Daily News article included as Appendix I. Seemingly, film maker Michael Moore had this right in Fahrenheit 9/11. The long-awaited 28 pages of a 2002 congressional report on the 9/11 attacks have been released. The document indicates that prominent members of the Saudi Arabian were involved in planning and financing the terror attacks. The declassified documents were released by Congress on Friday and released them the same day, release of the documents confirmed suspicions that the terrorists involved in the 9/11 attacks – most of whom were Saudi nationals – likely received support from high-ranking Saudi intelligence officers. The documents go on to explain that the magnitude of Saudi involvement isn’t clear because the US government only began to “aggressively investigate” after the attack already occurred. “In their testimony, neither CIA nor FBI witnesses were able to identify definitely the extent of Saudi support for terrorist activity globally or within the United States and the extent to which such support, if it exists, is knowing or inadvertent in nature,” the report states. However, it does list prominent Saudis suspected of being involved with terrorism by US intelligence agencies. Suspected Saudi intelligence officer Omar al-Bayoumi is given a detailed summary in the report. The report starts that FBI files indicate that al-Bayoumi provided “substantial assistance” to 9/11 hijackers Khalid al-Midhar and Nawaf al-Hazmi, two of the five terrorists who crashed American Airlines Flight 77 into the Pentagon. The report goes on to state that there is reason to believe that al-Bayoumi’s meeting with the terrorists was not accidental. He had “extensive contact” with Saudi government establishments in the US during the same time as the meeting with the hijackers, and received financial support from a Saudi company affiliated with the Saudi Ministry of Defense. Al-Bayoumi is further incriminated in the report by his close association with Osama Bassnan, who himself is known to have had extensive contact with al-Midhar and al-Hazmi. He lived across the street from the two hijackers and told an FBI asset that he met the men through al-Bayoumi, and claims that al-Bayoumi “knew the men very well.” Bassnan told the same asset that he “did more than Al-Bayoumi did for the hijackers,” the report states. The report says that the FBI received indication that Bassnan himself was a supporter of Osama bin Laden who might have been a Saudi intelligence officer. “According to a CIA memo, Bassnan reportedly received funding and possibly a fake passport from Saudi Government officials. He and his wife have received financial support from the Saudi Ambassador to the United States and his wife,” the report states, adding that Bassnan had also received money from a member of the Saudi royal family. The report linked Abu Zubaida, a senior Al-Qaeda operative captured in 2002, to certain numbers in the United States by going through his phonebook. One of those numbers is subscribed to by Aspen-based ASPCOL Corporation, a company that was managed the affairs of Ambassador bin Sultan, even though the phone number was unlisted. The report cautions that the information presented should not be taken as a complete or perfectly reliable assessment of the information presented, since it is largely a compilation of FBI and CIA documents. “It was not the task of this Joint Inquiry to conduct the kind of extensive investigation that would be required to determine the true significance of any such alleged connections to the Saudi government,” it stated. However, the report did indicate that information it presented strongly points to elements of the Saudi government having a hand in the 9/11 attacks. “[I]t is possible that these kinds of connections could suggest … ‘incontrovertible evidence that there is support for these terrorists within the Saudi government,’” the report said, quoting a document from July 2002, which had its name redacted. Saudi Arabia, an ally to the US in the Middle East, has firmly denied any involvement in the attacks and repudiated the accusations against it. The nation had previously fought against the declassification of the 28 pages. Just in April, Riyadh threatened the US with economic fallout if Congress passed a bill that would allow the Saudi government to be held responsible based on findings from Friday’s report. Adel al-Jubeir, the Saudi foreign minister, personally told US lawmakers that Saudi Arabia would be forced to sell up to $750 billion in treasury securities and other assets in the United States if the 9/11 bill passes, since they would be worried that the assets could be frozen in American courts. This tune changed with Friday’s release of the documents, with the Riyadh officially welcoming the report, in hopes that it would remove suspicions about the Saudi government’s actions. “Since 2002, the 9/11 Commission and several government agencies, including the CIA and the FBI, have investigated the contents of the ’28 Pages’ and have confirmed that neither the Saudi government, nor senior Saudi officials, nor any person acting on behalf of the Saudi government provided any support or encouragement for these attacks,” Abdullah al-Saud, Saudi Arabia’s ambassador to the United States, said in a statement, according to Reuters. A federal judge has temporarily blocked Prince Bandar from moving money gained from his Aspen real estate sales to Saudi Arabia and other locations outside of the United States. U.S. District Judge Rosemary Collyer issued a temporary restraining order on Feb. 5 in response to a class-action lawsuit claiming that Prince Bandar acquired his Aspen real estate holdings with “illegal bribe payments” from a British defense company,BAE Systems PLC. Prince Bandar has denied the payments were illegal or were bribes, but instead maintains they were legitimate government funds audited by the Saudi Ministry of Finance. A hearing to determine whether the order should be extended is scheduled for Thursday at 3 p.m. in Washington, D.C.
“The $167.4 million in U.S.-based real estate Bandar continues to hold was acquired using the billions of dollars inillegal BAE bribe payments obtained from BAE,” the emergency application stated. The $167.4 million figure presumes Prince Bandar’s main Starwood estate is worth $135 million, even though it didn’t fetch that price while listed on the market for over a year. The lawsuit against Bandar claims that BAE leaders knew they were making illegal payments to Prince Bandar as partof an $86 billion arms deal in 1985 that amounted to “intentional, reckless and/or negligent breaches of fiduciary duty,” which, the lawsuit alleges, wasted BAE’s assets and hurt shareholders. The lawsuit naming Bandar was filed in U.S.District Court in September on behalf of the city of Harper Woods Employees’ Retirement System, which was a BAE shareholder. Harper Woods is a suburb of Detroit, Mich. The lawsuit was filed against the officers and directors of BAE Systems PLC, Prince Bandar and PNC Financial Group, the successor to Riggs Bank of Washington. “The illegal bribe/kickback payments were received and spent by Bandar here in the U.S., including over $100million to build one of the largest and most lavish personal residencesin the U.S., located in Aspen, Colorado, and known as ‘Hala Ranch,’” charged plaintiffs attorney Roger Adelman of Washington, D.C., in the application for the restraining order. “While Bandar amassed his palatial Colorado estate, many questioned exactly how Bandar could afford the lavish estate, the 50 full-time workers Bandar employed there, the entourage that accompanied his and his family’s increasing visits to Aspen, andthe hundreds of thousands of dollars Bandar was handing out in the Aspen community on an ambassador’s salary,” the application stated. But Bandar was always more than an ambassador. Bandar is the grandson of the founder of Saudi Arabia, King Abdul, also known as Ibn Saud. He is married to the daughter of the late King Faisal. And his father, Prince Sultan, is now next in line to the Saudi throne. 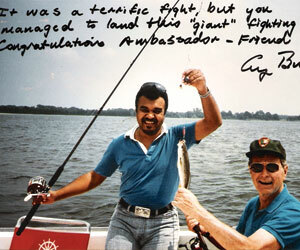 His Royal Highness Prince Bandar bin Sultanbin Abdulaziz served as Saudi ambassador to the U.S. from 1983 to 2005, when he was appointed secretary general of the Saudi National SecurityCouncil. Prince Bandar bought his main Starwood property in 1989 and the 56,000-square-foot home on the property was finished in 1991. In 2006, Bandar listed the primary residence for sale for $135 million, but pulled it off the market in November. A month later, Bandar sold another home in Starwood he had built for one of his daughters for $36.5 million and also sold two other Starwood properties near his main estate for atotal of $49 million. “Those sales proceeds have already likely been transferred to Saudi Arabia or other countries outside of this Court’s grasp,” wrote attorney Adelman in his application for the restraining order. “In addition to Hala Ranch, Bandar purchased (using bribe payments) and continues to own at least two other private residences in Aspen, 22 units at the Aspen Inn that are used by his staff, and an office suite that houses his Aspen lawyer,” the application for the restraining order stated. The condo units are at the Inn at Aspen at the base of Buttermilk. Bandar’s Aspen attorney, William Jordan III, has a second-floor office on the Cooper Avenue mall. Bandar, Saslove and Jordan could not bereached for comment on Monday. Nor could attorneys for Bandar and the city of Harper Woods pension fund. The restraining order doesn’t prevent the sale of any of Bandar’s real estate, but requires that any resultingmoney not be transferred out of the country. The suit was filed by attorneys with the San Diego law firm of Coughlin, Stoia, Geller, Rudman and Robbins. The firm was founded in 2004 by William S.Lerach, a well-known class-action attorney who resigned from Coughlin, Stoia in October shortly before pleading guilty to one count of conspiracy to obstruct justice and make false statements. He confessed to being part of a scheme while at the law firm of Milberg Weiss to pay clients who filed class-action lawsuits against companies. Lerach, 61, was sentenced Monday by afederal judge in Los Angeles to two years of probation, 1,000 hours of community service and $250,000 in penalties. Through a London law firm in June, Prince Bandar denied any wrongdoing regarding the BAE payments. “The accounts at Riggs Bank were in the nameof the Saudi Arabian Ministry of Defense and Aviation (MODA),” Bandar’s statement said. “Any payments into those accounts made by BAE were pursuant to the Al-Yamamah contracts and as such would not in any way have been secret from the parties to those contracts. “Whilst Prince Bandar was an authorized signatory on the accounts any monies paid out of those accounts were exclusively for purposes approved by MODA,” the statement said. Also in June, BAE issued a statement saying the payments were proper. “The Al-Yamamah program is a government-to-government agreement and all such payments made under those agreements were made with the express approval of both the Saudi and the U.K. governments,” the statement said. Britain’s Serious Fraud Office was investigating the Al-Yamamah deal but closed their review in December 2006. Last month, a British intelligence report disclosed that the investigation into the arms deal was closed because the Saudis might stop sharing valuable information with British officials about terrorism. In September 2007, the Saudis agreed to buy 72 fighter jets from BAE for almost $9 billion. The U.S. Department of Justice is now investigating the Al-Yamamah matter and the payments to Prince Bandar. Prince Bandar has hired attorney Brad Reynolds of the Washington, D.C., law firm of Howrey LLP to represent him in the city of Harper Woods lawsuit and presumably to help with the Justice Department investigation. Reynolds is a former U.S. assistant attorney general with “extensive experience counseling clients on criminal andcivil matters under investigation by the U.S. Department of Justice,” according to the firm’s Web site. Attorneys for the BAE officers and directors have recently moved for dismissal of the city of Harper Woods lawsuit, saying that the pension fund does not have standing and that decisions made by officers of an English company should be reviewed in Englishcourts. Gallery | This entry was posted in apocalypse, cabal, energies, new energies, partners in contrast and tagged 28 pages, 9-11, 911, Bandar Bush, Gordon Duff, Saudi Arabia, Veterans Today. Bookmark the permalink.